There are four levels in this game. 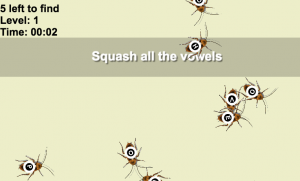 Squash all the vowels that you can find. More and more cockroaches appear as you go through the levels. How quickly can your team / you squash them all? This entry was posted in Language and tagged fun, grammar, vowels by smart. Bookmark the permalink.